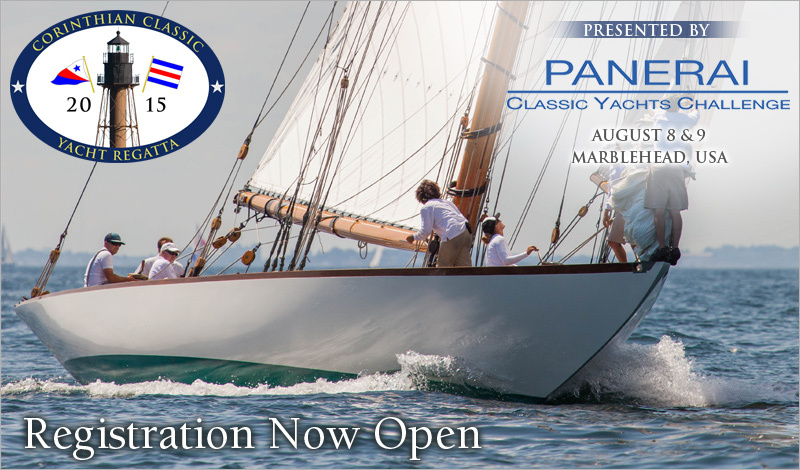 The Corinthian Yacht Club of Marblehead, MA is proud to announce the 2015 Corinthian Classic Yacht Regatta presented by Officine Panerai, the title sponsor of the Panerai Classic Yacht Challenge Circuit that takes place in the Mediterranean, Marblehead, Nantucket and Newport. This year's Corinthian Classic will be held August 8th & 9th. The "Panerai fleet" is open to sailing yachts with a minimum waterline of 20', made of wood aluminum or steel, designed and built using original methods and materials and built on or before 1970. The "Classic GRP"- (Glass Reinforced Plastic) - is for yachts built of fiberglass or yachts that have not been modified and have been designed during the CCA era on or before 1970. The "Spirit of Tradition fleet" is for those yachts designed with the intent to evoke traditional clean classic lines above the water line and modern underbodies below. Also yachts that do not fall into the other classes, i.e. boats that have been modified. This event has become a "must do" on the Classic Yacht Circuit. This is an event you don't want to skip. Start planning now. Instructions to enter can be found on our website at www.corinthianclassic.org.